Our luxury lodges are fitted with Scandinavian wood burning hot tubs for a natural outdoor experience. Hand made and environmentally friendly our hot tubs are easy to use and you can enjoy the beauty of your surroundings listening to the occasional crackle of the fire. A truly wonderful Log Cabin Hot Tub experience. Gaze up at the stars from your hot tub or listen to the sound of the Loch and look out over the water, our log cabins with hot tubs are the perfect antidote to the stresses of modern day life. 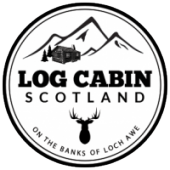 At Log Cabin Scotland we provide you with 3 bags of logs to get you started and more can be bought on site . The hot tub will take about 3 hours to heat up initially but once warmed if you leave the cover on when not using the tub they will reheat in an hour.